If the mark of a great movie lies in its ability to permanently tattoo a grin across the face of its viewer, Star Wars: The Force Awakens might just be one of the best movies ever made. I couldn’t help but smile profusely throughout J.J. Abrams’ stunning series revitaliser, so much so that by the time the credits began to roll (following arguably the best closing shot the saga has produced to date) my jaw felt like it had been tagged by a fiery lightsaber. We’re drafted straight into the chaos of war, and we see said chaos unfold from the perspective of both sides. Led by the evil Kylo Ren (Adam Driver), stormtroopers invade a small village looking for information on the whereabouts of Luke Skywalker (Mark Hamill), and the one-sided battle that ensues relays a tangible energy missing from those ill-fated prequels. The scene shifts thereafter to Rey (Daisy Ridley), a scavenger rappelling down an airy, desolate craft hoping to find extraneous junk she can later trade for food. Much like Skywalker in A New Hope, we meet Rey draped in white dusty robes — they’ve turned greyish — on a scorching desert planet (Jakku). Conversely, Ren’s First Order starship is chrome-like and glossy. When we promptly cut back to the vessel it evokes a sense of austereness, of strictly implemented structure, as if fear has been drilled into the crew by Ren and like-minded baddie General Hux (Domhnall Gleeson). By fervently switching between light and dark the film sets out its moral compass and highlights some truly wonderful sound design: the swoosh of lightsabers, the echoes of a vast ship. Ren is a terrific villain, full of dangerous complexity. Whereas Darth Vader would check his true emotion at the sliding door and favour an apathetic exterior, Adam Driver grants Ren an unpredictability that only serves to compound his menace. Finn (John Boyega) is the link bad and good, having escaped the former only to find himself caught up in latter. We have moved away from the post-Cold War machine landscape into a more sinister, dehumanised age — stormtroopers are no longer artificial clones, but actual human beings, and Finn doesn’t want any part of the cruel conformity. He meets Rey on Jakku towards the beginning, at which point Abrams opts to stick with the pair, relying on their camaraderie and bustling chemistry. She is isolated yet wily and proficient; he functions through a humorous backbone likely installed as a defence mechanism against his shady past. Ridley sparkles with vibrancy and Boyega is instantly likeable; together, they click into gear like a pristine Millennium Falcon. At times, you feel like you’re watching a buddy road trip venture, only here the sputtering cars have been replaced by sky-scoping jets. At one point both Rey and Finn repeat, “I can do this. I can do this,” perhaps speaking on behalf of their director who absolutely has ‘done it’. An information-touting droid named BB-8 trundles alongside the pair, spluttering hilarities. Oscar Isaac gushes charisma as Poe Dameron, premier fighter pilot for the self-descriptive Resistance, but he doesn’t feature nearly enough (nor does Gwendoline Christie’s First Order baddie Captain Phasma, who’ll likely see more screen time in the extended edition Blu-ray). The Force Awakens wouldn’t be a proper franchise sequel without some crowd-pleasing throwback nods and while these moments are smirk-inducing for those in the know, they also bear just enough subtlety to avoid alienating those taking part for the first time. The snappy one-liners are genuinely funny and this shouldn’t be undervalued; indeed, the fact that many of the gags are rich in Star Wars mythology affords them greater validation. Marvel films, by comparison, employ a similar comedy format and although the jokes are often funny, they don’t quite have the same vitality. A Kraken-esque battle scene inside a ship unfolds like something out of Doctor Who, only louder and bolder and much, much more expensive. Abrams’ film invokes the same melodramatic filling championed by the original trilogy: characters say mad things with a serious tone and pull it off. This is particularly true of Domhnall Gleeson, who offloads some terrific thespian yabber — 1977 wants its patter back — the best of which manifests during a maniacal speech straight out of Saruman’s playbook. But the outing is a playful fantasy at heart, a grandiose adventure, and everyone knows that. When some sentences creak, and some do, it’s just part of the charm. That certainly doesn’t mean screenwriters Lawrence Kasdan and J.J. Abrams (they redrafted an earlier Michael Arndt script) avoid hefty solemnity. There are instances of genuinely shocking gravitas, moments bolstered by Dan Mindel’s sweeping cinematography. The landscapes that unfold before our eyes feel authentic, primarily because they often are. Fight scenes boast substance too and the action is easy to comprehend, therefore the stakes are raised. John Williams’ score, as if it really needs saying, is as wondrous as ever. Speaking of revamped classics, a few familiar faces join in on the fun. Harrison Ford’s grouchiness totally fits his older Han Solo, the rogue still fond of heart-warming cynicism. Carrie Fisher doesn’t have an awful lot to do as Leia, now a General, but her presence fuels the film’s emotional weight. Crucially, and this is true of the various other returnees, the duo serve the story: seeing our heroes back together in such a familiar environment is meaningful. It also ages the world in the best way possible — we know it is the same place as before, but we don’t know what fresh mysteries lie beyond the next star. The beauty of The Force Awakens is that it addresses the nostalgic needs of the many while simultaneously ushering in a contemporary set of filmic variables ripe for fresh storytelling. It’s not just about waiting impatiently for the old guard to reappear; the new faces are a delight. I say four stars for a truly fantastic motion picture romp, and one more to J.J. Abrams for his frankly ballsy decision to take on the hopes of a cine-nation and successfully rekindle that highly sought after magic. We really appreciate it. Thanks Martin. Glad we’re on the same wavelength, I think he’s done tremendously well given the pressure! Yup. He knocked it out of the park! Thanks Rob, I haven’t seen or read a bad review! Great write-up Adam, some nice lines in there! Well we do feel pretty much the same way about it, and the same as many others, so it’s all a bit of a relief. I’d like to see that extended cut if/when it comes out, just to see if it improves certain aspects that don’t quite work. But whatever…mostly very, very good, and I can’t believe how much I laughed. Some of it was surreal…Chewbacca getting a “whose a brave soldier?” routine from a nurse. Honestly! Ha, yeah that Chewbacca-nurse line got a big reaction in my screening room. I laughed a lot too in general, and practically all of the laughs felt earned. The extended edition will be interesting to see; it definitely feels like one or two characters suffered on the chopping board, but that’s only a minor squabble for me personally. Much to look forward to! Glad you enjoyed it so much. I agree it was a fun ride but I wish they hadn’t reused so many plot points. 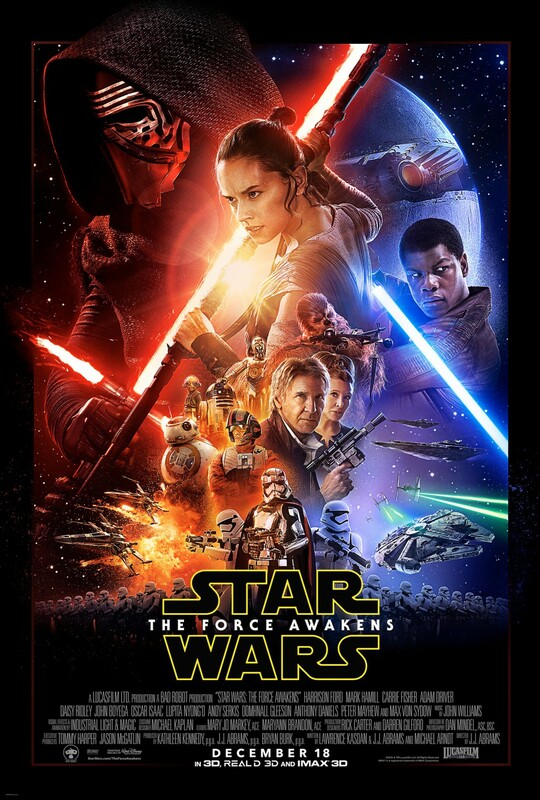 It took a lot of the magic out of it for me but J.J. Abrams did a good job of capturing the Star Wars feel. Thanks Sean. I get your misgivings, but the homage style worked for me. It’s what I expected. I think going forward they’ll change it up! Cool you LOVE this so much Adam. “A Kraken-esque battle scene” ahah that made me laugh, but yeah the action sequences were cool, but I expected that given the film’s mammoth’s budget. I really love the casting of Ridley and Boyega, I look forward to seeing more of those two! Thanks Ruth! Ridley and Boyega meshed brilliantly, the casting folk have absolutely hit the jackpot with those two. Very excited for the future. Five stars indeed! Abrams did about as good a job as he could under the circumstances. Absolutely. Seeing it again this week at the IMAX. Not normally an IMAX/3D fan, but heard good things!